I gave my attention to the pause. I gave my attention to the frozen Skype image. I gave my attention to waiting. We were on hold. We could see but not touch and yet touch was composing us. We were broken only where skin could not answer. Iris’ skin is ornamented with tattooed threads, mingling with each other in scrolls and coils, and alternating with straight lines. An image is truly raw and visible, fibres and sinews, strips and straps. The sense of beauty merges with and is consumed by the sense of reminiscence. Iris shuts down her computer. Iris stands up. Iris stretches her neck, shoulders, back. Iris shakes the cramps from her elbows, wrists. Iris releases, recollects. 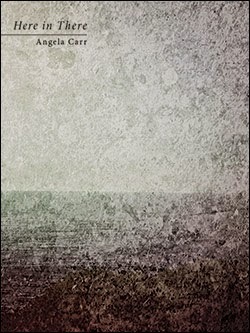 Poet and translator Angela Carr’s third trade poetry collection is Here in There, following her collections Ropewalk (Montreal QC: Snare Books, 2006) and The Rose Concordance(BookThug, 2009). Constructed in five sections of short, untitled prose poems, Here in There gives the appearance of being a single, extended suite that even skims up against the structure of an abstract novella constructed out of self-contained fragments. Predominantly constructed out of an accumulation of prose poems, Carr’s structural focus appears to be entirely upon the sentence, as she crafts lines that follow lines that build upon other lines to forward, push and wash over like water, deep into a prose that swims between abstracts and the concrete. As she writes in an early part of the collection: “I was directed away from the Everywhere Beautiful. I turned off my computer. I stood up. I stretched. I entered the kitchen. I gave my attention to the refrigerator. I sought its answers. I sought the composition of preservation in the cramped space of provisions.” The fourth section, “Other Signs,” is particularly interesting for the sake of the shift in tone and shape, moving from the prose poem to a series of individual sentences. The entire fourth and fifth sections feel structured as asides from the narrative of the first three sections, as the fourth opens an almost Greek chorus-like conversation on the idea of naming. It suggests a number of questions, including: just who is Iris, and what exactly is in a name? A name is any number of cities. Wind drives its enactment. A name is any number of exits. Ornamental letters are created from rows of flat stitching. The maximum strength of any geometric pattern depends on a balance of tension vectors. Then I may cease to address you by name. The library ceiling was aqua and gold. Iris waited for a rare book to be brought out from a closed stack. Iris gave her attention to surprising 19th-century colour prints. Iris gave her attention to symmetry. Symmetry was a factor of excessive influence, a flat weaving of desire. Symmetry bides its time for a perfect illusion. Yet the act of waiting has no parallel: it is an instance of asymmetry. Iris gave her attention to the singularity of a unique action. A bias is a systematic distortion in the social fabric. Ambition is a determination, an upward measure. Iris gave her attention to the century. Let’s compile an index of its errors. Iris gave her attention to suppleness. Not truth but the fact of weather without borders. Here, pages were cracking. Water creaked through the pipes in the building. There were 156 units. Every amatory relation contained within the urban ambit both vast and miniscule. Iris and I were the creation of parts of an amorous whole or a composite beast that could express nothing more frightening than love’s unrelenting desire for beauty. Whether in a symmetry of agreement or in symmetry of judgment, we were blushing. Purchase Here in There HERE.